There’s a man named Jarhead Earl who’s quite the fighter — some say the best. He tries to work an honest living, and saves the fists for the occasional pick-up fight, now and again. But as his family starves, and he becomes desperate for money, he realizes he can solve all his problems if he lets his monster all the way out. There’s a man named Angus that they call chainsaw, maybe on account of his meth-cooked face. He and his sister, Liz, sell meth to the working poor, when they aren’t smacking each other around and planning fratricide. But a poor choice of colleagues has led them to a sorry financial state, and now they need a little something extra to get everything good again. And there’s an old man named Purcell, who lives out in the boonies, all by himself. He can see what’s coming down the pipe — visions, you might say — and knows that a massive, nasty storm’s coming. And he can see Jarhead’s going to be riding it, though he doesn’t quite know how, or why. And then there’s the Donnybrook: a brutal, three-day underground fighting festival that happens once a year, at a farm up in Southern Indiana. A sick shadow of a man named McGill has people come there from all around to bet on the outcome as 20 men try to up and kill one another with their bare fists. That they drink, drug, and whore themselves into near-oblivion at the same time just adds to the fun, and his quite-considerable coffers. 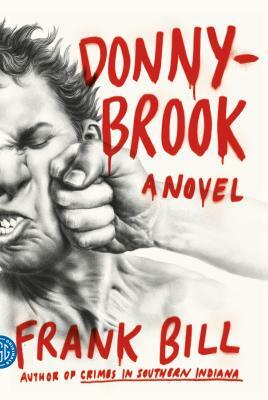 Donnybrook is the first novel by Frank Bill, who came to attention with his short story collection “Crimes in Southern Indiana” in 2011. That attention is rightly deserved: Bill takes what could be just another post-Tarantino, weird and nasty rundown, and, though the use of language alone, turns it into a brutal but poetic ballet. This novel’s prose is almost Shakespearean (as is the body count) and while it’s is filled with all kinds of gruesome violence, it isn’t weighed down with the near-pornographic description other authors might choose to use. A perfect punch to the nose? Not quite. Too many characters rotate in and out of the squared circle to keep full track of, at times, and the sudden introduction of certain near-incongruous elements at the very end turns what could have been a satisfying ending into something of a glancing blow. However, having said that, this book is a luscious fist to the brain that is going to knock you out of your shoes. It will hopefully be the first of many works by an author with a truly unique voice, and while that sort of complement sounds trite in a review, I can promise you that it is well-deserved, here.